While it may seem outlandish to some people, in certain college towns a graduate student stipend is sufficient income to purchase a home, particularly if combined with a second person’s income. However, should PhD students buy homes while they are still in graduate school? Graduate school is a somewhat unique life situation, so graduate students must ask themselves a number of questions beyond what is typical for the average person considering buying a home. How many more years of school do I have? How likely am I to finish the program? Will I stay in the area when I’m done? The broad rule of thumb is to only buy a home that you plan to stay in for at least 5 years (however, the exact breakeven point will vary with the local market and individual purchase). If you plan to stay in the same city post-grad school, buying is a more viable option. If you plan to leave the city and do not want to become a long-distance landlord, buying near the start of a PhD program is most advantageous. Keep in mind that the overall PhD completion rate is only somewhat north of 50%; grad students who leave grad school earlier than anticipated may feel saddled with a home at an inopportune time. If you plan to rent the home after you move on from it, whether the property is a good investment must be considered before the time of purchase. Be as realistic as possible and consider the best- and worst-case scenarios with respect to a home purchase. Will I live alone, with my family, or with roommates/renters? With whom one lives certainly will influence the size of the home and the mortgage cost. If living alone is your priority, it is more likely that you will find an affordable rental than home for purchase. If you are open to living with roommates and have enough savings to afford the home on your own if necessary, buying a multi-bedroom home may be a good option. If you want to live only with your family, you will have two incomes to consider when looking for a mortgage and need to seek an appropriately-sized home. Will my housing needs change in the next few years? Graduate school often corresponds with a period of life with many transitions, such as family formation. Will the home purchased at the start of graduate school as a single person serve a married couple and/or a child just as well in a few years? What if you tire of living with roommates? Do I qualify for a mortgage (income type, job history, credit)? Whether or not a graduate student can qualify for a mortgage is much more of a question mark than a person with a typical job with the same income. Of course, a graduate student’s income is low, so a co-borrower may be necessary in some markets. The way some graduate students are paid (namely, fellowships) may not qualify for a mortgage with some lenders who don’t understand fellowship income. However, if you shop around for a mortgage thoroughly you should be able to find a lender that is willing to scrutinize your situation and determine that you are a good risk if you can demonstrate that your income will be steady. Do I have sufficient savings to cover a down payment, fees, repairs, and vacancy? Buying a home is very expensive in the short-term, and some homeowners are unlucky to live in a home in just the period when it needs a lot of care. First, there is the down payment and cost of purchase. Depending on the permissibility of the lending environment, it may be possible to get a home loan with little to no money down, but that is almost never a good idea. Assembling a larger down payment (10 or 20% of the price) gives instant equity in the home, proves to yourself and the lender that you are capable of saving money, garners better loan terms, and avoids paying Private Mortgage Insurance (PMI) (> 20%). Closing costs are 2-5% of the home’s value ($3,700 on average) and are typically paid by the buyer (source), while realtor fees are typically paid by the seller. Second, a home requires ongoing maintenance. A rule of thumb is that you should expect to pay on average 1% of the home’s value per year in repairs. However, as that is only an average and an estimate, a homeowner’s emergency fund should be sufficient to cover several ‘years’’ worth of maintenance at once. If you are renting to roommates, the responsibility to keep a sufficient emergency fund is even greater for more immediate repairs and to cover vacancy. Further reading: How Much Does It Cost to Maintain a House? Am I prepared to care for a home? This is a lifestyle question. Some people are very excited to maintain their own homes, while others lack the knowledge, skill, or time to do so. If you are a first-time homeowner, you need to consider what the home will require of you and whether you can provide it. Can I afford to furnish the home? Unfortunately, owning your own home is sometimes accompanied by the pressure to upgrade. Suddenly, the secondhand furniture from Craigslist doesn’t mesh with your new home, and you have additional rooms and a backyard to furnish. Whether or not you choose to buy additional or newer furniture is up to you, but just be aware that if you can’t afford to you may have to overcome some temptation and perhaps social pressure. How strong is the market historically, both for selling and renting? It’s not possible to predict which way a housing market will move; you should be financially and emotionally prepared for your new home to dramatically drop in value right after you purchase it. However, you can look at the history of the housing market in your city to see how the patterns of boom and bust have played out locally – some areas are more stable or tend to recover more quickly than others. College towns, generally, have a stable demand for housing, if you plan to rent your home while you live in it or after. 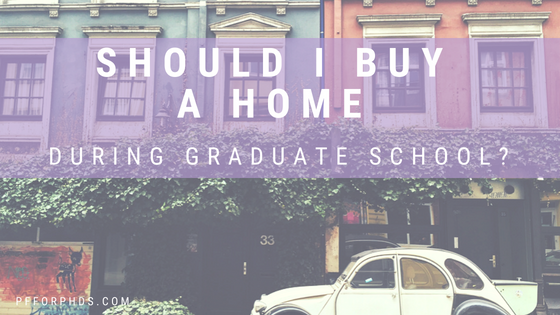 Whether or not you will be able to buy a home as a grad student depends both on the local housing market and the resources available to you (a second income, savings). While not many graduate students are homeowners, those that are have a great opportunity to grow their wealth through (possible) equity and/or rental income, at least in comparison to what is spent on rent. I am going to be attending pharmacy school out of state and realistically the 4 years I am there its smarter to buy a home. Only question is the loan situation, I need to take loans annually to pay for tuition, will having a loan for a mortgage affect me qualifying for government student loans?